It’s our first day in our sleek new office space in the commercial section of Greenbridge Condominiums in Chapel Hill, and we’re thrilled to be here! Located on the ground floor at 601 W. Rosemary, on the edge of the historic UNC Chapel Hill campus, our new office is just a block from the eclectic shopping districts of Franklin Street and nearby Carrboro. Long the center of social life for the campus, Franklin Street and its neighbor, Carrboro, are filled with amazing restaurants, music venues, bars, coffeehouses and other popular and funky businesses. And we’re now right in the heart of all this activity. Our new 4,700-square-foot office was designed by Phillip Szostak, an award-winning architect with Szostak Design. Known for his elegant, minimalist designs, Phillip has come up with a stunning, airy workspace for Rivers Agency that reflects our own creative spirit — innovative, engaging and inspiring. On the first floor is our team of artists, designers and wordsmiths. 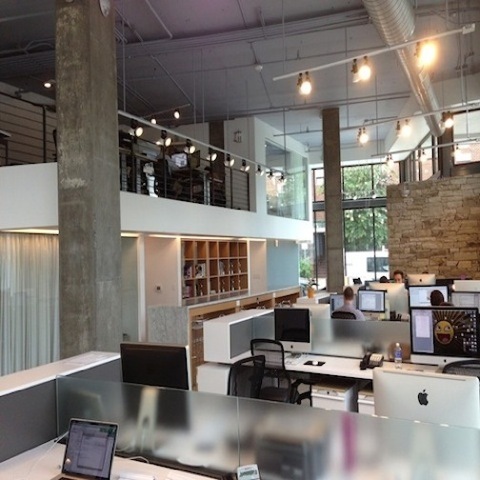 The team works side-by-side in banks of open, high-tech workstations, with easy access to technology and each other. Desk systems are clean and simple, with frosted glass dividers used to separate spaces rather than cubicles and walls. This area is bathed in natural light as well as state-of-the-art LED lighting from Cree. A stone decorative element near the front entrance adds a warm, earthy touch, and exposed concrete sup-ports and fixture elements provide additional visual interest. Along with housing our design and public relations departments, the first floor features multiple conference rooms for client meetings. It also includes room for a kitchen and an outside patio that will be used for meeting and entertaining. A center stairway leads to a second mezzanine level. This space holds our executive offices and more meeting and working space for our development team. We think we’ve created the best work environment in Chapel Hill. It’s friendly and collaborative, and we can’t wait to share it with our clients and friends. We’ll be popping a few champagne corks today to mark Day One here, but the real celebration will come in August, when we’ll officially unveil the space with a launch party. More details to come soon in this blog. Wow, amazing. I’ll be in Chapel Hill this September visiting my sister, and we’d love to peek in and see the new office. wow, this looks stunning! i love it! can’t wait to visit!